Merel used to be the center of attention at home, but everything changed when her baby brother was born and that isn't easy for Merel. Her brother is sick and needs all of her parents' time. Merel is lonely, angry and sad. When she finds a little violin it's the beginning of a long search. Her sleep has left her and she needs to get it back. To do this she has to go to the mysterious Lullaby Grove. Will she be able to find this place? While she's on her journey Merel meets many different people. She isn't the only one who's lost her sleep. There's a dangerous man who keeps coming after her and she has to outrun him. Will Merel's mission succeed and when she's finally at the end of her journey will she have learned something from her adventure? 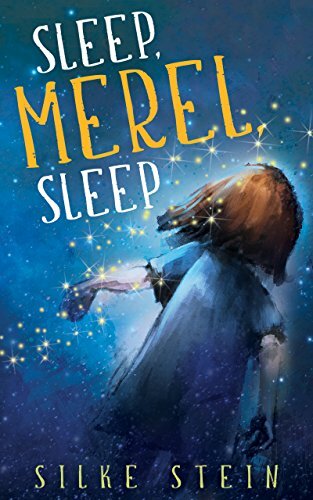 Sleep, Merel, Sleep is a wonderful magical story. It's difficult for Merel to adjust to her new situation. Before her brother was born her parents were always there for her and now they're spending most of their time with Merel's brother. She's frustrated and when she loses her sleep there's nobody there to help her figure things out. She has to go on a perilous journey on her own to retrieve something very important. I was immediately intrigued and was captivated by each character Merel meets. They're all equally fascinating. Silke Stein uses beautiful words to tell Merel's story. I loved her world building skills and her descriptions of Merel's search are thorough and detailed. I also liked the idea behind Sleep, Merel, Sleep. Sleep is incredibly important and losing it would be a true nightmare. I loved how Silke Stein turns sleep into a reality with many interesting layers. I really enjoyed Sleep, Merel, Sleep it's a fabulous enchanting story. Sleep, Merel, Sleep is a fun story for both children and adults. Children need to have some reading skills to understand this story. I'm a graphic designer and writer, currently living in Victoria, British Columbia, the wondrous place that has inspired my first novel, the middle-grade read Trina Bell's Humming Summer. Like my protagonist Trina, I enjoy roaming the city's parks and listening to the squeal of tiny sparkling birds. Yes, I speak to them and they answer ― but unfortunately, unlike Trina, I don't have a three-legged dog who translates for me. Having lived landlocked in Germany for most of my life, I fell in love with the Pacific Ocean when I came to Canada. Combing beaches has become my favourite pastime, particularly looking for mermaids' tears. I cannot resist picking up those shiny, colourful pieces of sea glass and adding them to my ever-growing collection. Early in 2014, I became a member of 'SeaglassLovers', a Facebook group comprised of people from all over the world who show each other their fabulous finds and daydream of being mermaids. There I learned about the places every sea glass aficionado has on her bucket list: Seaham in England, Davenport in the USA and, of course, Fort Bragg in Northern California ― home of the legendary 'Glass Beach', which is the enchanting setting of my upcoming women's fiction novel Foam On The Crest Of Waves. And when I'm not at the beach, or writing, or helping my husband to playtest his latest board game invention, I design book covers for fellow authors. 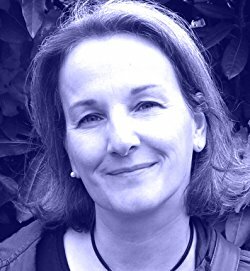 I am a graphic designer and the author of the middle-grade novels Trina Bell's Humming Summer and Sleep, Merel, Sleep. I'm German, but currently live at the Canadian west coast. My husband and I run a small board game company; he invents the games and I do the graphics. We play-test a lot. I love to be outdoors, collect sea glass, and I'm a closet birder. I grew up around art, so my interest in design and photography didn't come as a surprise. Yet, my main passion has always been reading; I was my family's official bookworm. 2) How did you get the idea to write a story about the loss of sleep? It's kind of funny I wrote this story, because I seldom struggle with the problem. I sleep like a log and can nod off almost anywhere. The initial idea for Sleep, Merel, Sleep dates back to the early 2000s. I thought of sleep as an actual person and imagined him looking a bit like the flying people in paintings by Marc Chagall. My mother owned an art print of 'The Artist and His Bride', and it has this small violin player floating in the middle. During plotting and playing out the story in my mind, I envisioned the illustrations for the book as inspired by Chagall, dreamy with lots of blues. I use the disappearance of Merel's Sleep as a symbol for the loss of certainties in her life. She plunges into the unknown and tries to regain balance and peace of mind. 3) Can you describe Merel in ten words? Brave girl, confused by grief, trying to make things right. 4) Could you describe the world Merel ends up in and your inspiration behind it? It's a dreamlike, shifting world of few and fleeting comforts. Merel has to find a place she's never heard of before; she has no idea how it looks, where it is, let alone how to get there. It's an unsettling experience, scary and full of nasty surprises. This world just doesn't make sense. It's a picture for life becoming overwhelming, when it seems that every time you think things improve, they shortly after take a turn for the worse. But there are also reminders of happy moments, visions of how life could be, and unexpected insights and new-found friends along the way. The story is lightly inspired by Alice In Wonderland, but it is a much more emotional journey. 5) You’re a graphic designer and a writer, how do you combine these two passions? favourite child, but please don't tell them. 6) You love sea glass, how did you fall in love with these beautiful pieces? I lived land-locked in Germany for most of my life. But then I met the man who was to become my husband and moved with him to the Canadian west coast. He introduced me to sea glass on one of our first beach walks (now he wishes he had stayed mum as our apartment is teeming with it); I became infatuated and have collected it ever since. Sea glass actually inspired me to write my first adult novel, Foam On The Crest Of Waves. It is set in a fictional twin of Fort Bragg, which is one of the dream destinations for every sea glass lover. This small town in Northern California has magical beaches full of shiny glass (former garbage dumps transformed by a forgiving ocean). The novel is about the family of a delusional teenager who copes with her mother's drowning death by preparing to become a mermaid. The protagonist is a young artist making sea glass jewellery with the pieces she collects at her home town's shores, thus acting out what I would like to do. 8) How did your writing career start? It all started in the early 2000nds, shortly after my niece was born. Suddenly funny children's lyrics were bubbling out of me and demanded to be written down. It was quite surprising. At that time, I wrote in my native language of German and soon branched out to short stories for kids. I queried a couple of publishers and almost had a poem made into a picture book. Then things happened in my life and writing got lost in the shuffle until the late 2000s when I found myself in Victoria, BC, and, inspired by my husband penning a middle-grade novel, felt the urge to turn my Canadian adventure into the story that became Trina Bell's Humming Summer, the first book I wrote in English. 9) You design stunning book covers, what key elements does a good book cover need to have? Thank you :) I'm actually fairly new to cover design. My journey started two years ago when the need arose the have a cover for my first self-published novel. I used a beautiful vintage hummingbird illustration by one of the great ornithologist from the early 1800s and created a clean and pretty cover — a cover that unfortunately communicated neither the fun and excitement of the story nor the audience it was written for. Since then I have learned a lot, particularly about the different genres and their nuances. A good cover is a cover that sells and, apart from it looking intriguing and professional, reader expectations are paramount. Readers tend to pick books that looks similar to other books they have enjoyed. When you examine covers from one category, you will easily see the common traits. So a cover has to look the same as the others in its genre but still offer something different and attention grabbing. I like covers clean, memorable, and not overloaded — the cover doesn't have to tell the whole story, it just has to hint at it or emphasize a key aspect. With Sleep, Merel, Sleep and Trina Bell's Humming Summer, I tried to meet the middle-grade need for illustration while showing the mood of the stories, one dreamy and wistful, the other exciting and cheerful. For any independently-published book that will most likely not sit on many bookstore shelves in the flesh, it's also super important that the cover looks great as a thumbnail. I'm planning to release Foam On The Crest Of Waves in the fall (more info on my website www.silkestein.jimdo.com). If anybody is interested in an advance reading copy, please contact me. Currently I work on an idea for a cozy mystery series set in Victoria, BC, and I have started writing a sequel to Trina Bell's Humming Summer; the working title is How To Make A Peacock Smile. There's also a dystopian/sci-fi romance simmering on the back burner. I haven't settled on a genre yet — I'm going to cast my net wide and hope to end up catching enough readers to make a living from writing in the not-too-distant future. In the meantime, I intend to hone my cover design skills and would be happy to find more authors who'll trust me with creating something beautiful for their books. 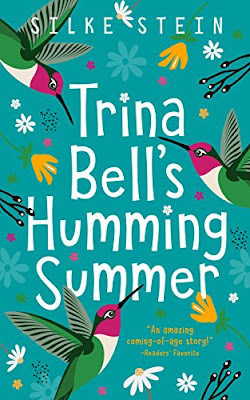 The next few days you can download Trina Bell's Humming Summer for free on Amazon. One very lucky reader of With Love for Books will receive a signed paperback copy of Sleep, Merel, Sleep by Silke Stein. Three runner ups will receive a digital copy. Sleep, Merel, Sleep sounds like a beautiful, surreal tale with a lyrical prose and a dreamlike fantasy world. This sounds wonderful & I Love the cover. Looking for a good book for my upcoming surgery in July this could be it! All the best for your surgery! Poor little girl. It sounds like a great story. My idea of a perfect read for the garden! I'm so impressed that anyone can write a novel in anything other than their mother tongue. I have a degree in French and would consider myself fluent, but descriptive writing is another matter entirely! Sounds wonderful! I'd love to read it with my daughter. Silke, how I wish your book was around when my sister was little. She was so jealous of the attention I used to get because I was always ill. She swore she was an orphan from a foreign land, brought over just to keep us amused! Poor kid!